BOTTOM LINE: An exquisitely immersive set design coupled with an eerie and uncomfortable performance makes this piece of downtown theatre haunting and intriguing. We’ve all seen minimalist theatre with no set. But have you ever seen a maximalist set and no theatre? Holiday House is like watching a one-woman show inside of a glorious art installation. When the door opens, you enter what feels like a dollhouse big enough to accommodate roughly twenty-five audience members and one performer. In other words the theatre is the set, and there is no line between the play and its audience. If you’re terrified of audience participation, don’t worry. Tracy Weller, the sole performer, doesn’t really expect you to participate, but the experience is about as intimate as theatre gets. Though she does make eye contact with you as she acts up a storm, instructing you to do things like pick up a book only to yell at you for doing exactly as she says, it’s not personal and she doesn’t single out any one audience member. The experience is remarkably non-invasive mostly because the space never allows you to disappear into the dark, and we feel as though we are invading Weller’s space, not the other way around. Though personal space is scarce—be sure to drop off your Christmas shopping at home before you come—the experience is cozy and comfortable. Cushioned seats along the perimeter of the house are provided, and I found my seat more comfortable than the usual auditorium seating that I’m used to. Holiday House is a unique experience. It begins as you enter a lobby decorated to the gills with holiday cheer, like a Christmas exhibit with ornaments of every size and shape and colorful lights galore. The friendly house staff invites you to partake of cookies and eggnog (rum and brandy are on hand for spiking if you’re so inclined). Just when you think the space can’t get any more friendly or warm, Santa Claus makes an entrance and sits on a big red chair, open to any child brave enough to hop on his lap and divulge a wish list. There were no takers when I attended, and so Santa sat awkwardly all by his lonesome, a sight that was equally melancholy and unnerving. But what I realized, once the show began, is that the unnerving Santa was the perfect segue to what we were about to experience. About ten minutes into the performance, I was glad there were no children in attendance to sit on his lap, because the show is creepy, perverse, and even a bit morbid. That’s my kind of holiday show, but if you’re looking for It’s a Wonderful Life, you’re not going to find it here. As we settle inside the carpeted dollhouse, we discover Weller, dressed as a child, face-down on a mound of Christmas decorations. Above her, through a hole in the ceiling, detached Christmas lights dangle and snow gently falls. Did she fall through the roof of her house while decorating? Is she dead? She rises to reveal a bloody gash on her forehead and bemoans her pain as she unwraps a Band-Aid, but then oddly gives it to an audience member. What ensues is a child-like character reliving unpleasant moments from her childhood, such as being scolded about snacking before dinner and being warned that, if she’s bad, some undefined boogeyman will be summoned to take her away and assault her sexually. Yeah. At this point, you’ll be glad you left the kids home with a sitter. So what’s with the friendly and warm holiday experience followed by a creepy, eerie, morbid one? I’m not exactly sure. But if you’re an adventurous theatregoer, Holiday House intrigues. Weller’s performance is spine-chilling and riveting. Justin and Christopher Swader’s set design is a triumph. Zach Blane’s lighting and Phil Carluzzo’s sound complete the immersive experience which runs roughly 65 minutes. Directed by Kristjan Thor, Holiday House is open to interpretation. You’ll be glad you treated yourself to something completely different and unique this holiday season, just as long as you know what you’re getting yourself into. The show will initially heighten your holiday cheer and then cleverly disrupt it. This ain’t no Frank Capra Christmas. 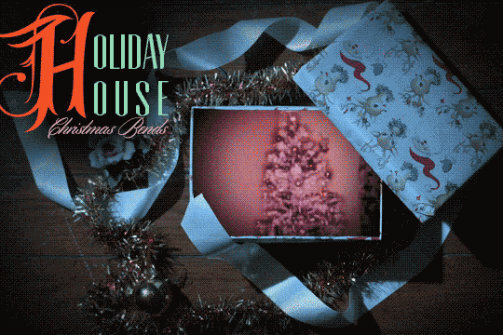 Holiday House: Christmas Bends is written and performed by Tracy Weller, created by Bixby Elliot and Tracy Weller. Directed by Kristjan Thor. Set Design is by Justin and Christopher Swader. Costume Design is by Natalie Loveland. Lighting Design is by Zach Blane. Music and Sound is by Phil Carluzzo. Projection Design is by Joseph Mastantuono.